Looking for a challenge? Witness some of the most spectacular views and hidden gems of the Pennsylvania Wilds while competing in an adventure trail race. Whether you're looking for a way to challenge yourself or explore the area's wooded trails, there are so many adventure trail races in the Pennsylvania Wilds that will keep you busy for years to come. The Allegheny 100 (or A-100 Challenge) is an unsupported endurance hiking challenge that takes participants through the Allegheny National Forest & Surrounds landscape of the PA Wilds and utilizes the North Country Trail (NCT). On this trail, participants will not see timekeepers, aid stations or a finish line. Hikers are tasked with establishing these items for themselves, as the event challenges participants to traverse 25, 50, 75 or 100 miles in 50 hours. The direction of the hike changes each year, giving hikers an opportunity to see different parts of the trail. Organizers note that usually only about 20 percent of participants are able to reach their goal, with most of those who fall short of 100 miles completing their journey at the 50-mile mark. Taking place among the rolling hills and dense forest of the Marilla Reservoir in the Allegheny National Forest & Surrounds landscape of the Pennsylvania Wilds, the Marilla Trail Race offers two different course distances (7 & 14 miles). A four-mile hike is also an option! While the courses are non-technical, runners can expect intense elevation changes on the rolling trails. Except for one road crossing, the race is 100% off-road! An added bonus: all proceeds benefit the Tuna Valley Trail Association, which develops and maintains the local trails. Take part in this one-of-a-kind adventure race that begins in Warren and takes participants along a 13.1-mile run along the Allegheny River, one of only two designated National Wild & Scenic Rivers in the Pennsylvania Wilds! But that’s not where it ends! Next, participants complete a 20-mile bike ride consisting of non-technical mountain biking on the National Forest roads, followed by a 2.2-mile swim. Rounding out the event, registrants will prove their orienteering skills finding marked points over a rugged 6+ mile course, before running on foot for a 1-4 mile trail course and canoeing the final 7-mile leg on the Kinzua Reservoir. The race can be completed solo, by two people running together, or in a relay team of up to 6 people. The Sinnemahone Ultra Marathon winds through the Pennsylvania Wilds Elk Country utilizing Elk State Forest trails maintained by the PA Department of Conservation & Natural Resources. Held on the third Saturday of October, this race gives runners a remarkable and colorful view of the PA Wilds and the animals that call it home. Runners can choose a 10k, 25k, or 50k race. Many sections of the race follow the Bucktail Path, which has been called the most isolated of Pennsylvania’s wilderness trails. What other race starts with a Jimi Hendrix style rendition of the National Anthem in the shadow of a beautiful, historic courthouse before musket fire releases 200 runners on State Game Lands? This race is known and named for its unique rock formations and is advertised as a “bone crushing 20-mile hustle through the woods, boasting of about 4,000-plus feet of vertical rise.” Your reward? A handmade “finishers rock,” an ice cold beer from local Straub Brewery (the third oldest family-owned brewery in the United States), and a winner-winner chicken dinner. The race is run by the county’s running group, The Elk County Striders. The PA Trail Dogs organize the infamous Hyner Trail Challenge, which takes place through the wooded trails around Hyner View State Park and Hyner Run State Park, part of the Dark Skies and Elk Country landscapes of the Pennsylvania Wilds. “Challenge” is especially appropriate for this rugged adventure, which features at least three major climbs and three major descents over a 25K or 50K course filled with vistas, stream crossings, and single track paths. Part of Trailrunner Magazine’s Trophy Series, this race is known for being punishing. Typically held in April, the payoff is a combination of shareable war stories and a notoriously RIGHTEOUS after party, as well as bragging rights for completing the challenge! The Frozen Snot is a gnarly winter adventure race that takes you through 13.5 miles and 5,600+ feet of elevation gain (or 8.5 miles and 3,775+ miles of elevation gain, if you choose the short course) on what is historically one of the coldest days of the year in early February. Mile for mile, it ranks with the most challenging in the nation. The rules are stringent for survival — all runners must have a traction device to cross the starting line, no cotton clothing —whatsoever — is tolerated due to the risk of hypothermia, and trekking poles are recommended to stay upright. The official sponsor of this race is the City of Lock Haven. 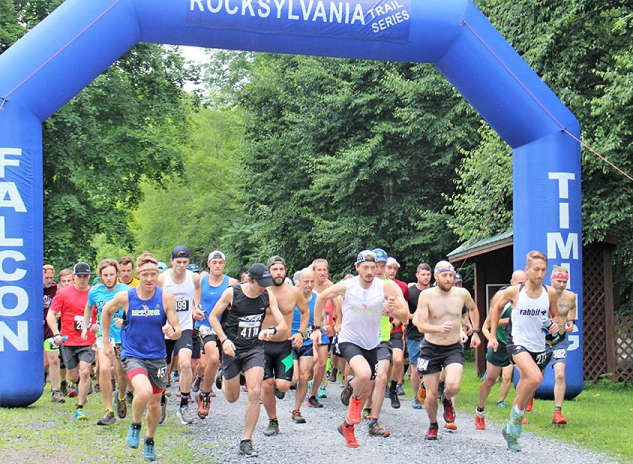 This 10k run through the mountains of Sproul State Forest has been touted as “the toughest 10k in PA.” It features three miles of uphill climbing to the top of McCloskey Mountain, and then a challenging 3.7 miles down to the finish with vistas, steam crossings, and a technical single track in the blistering heat of July. Organized by PA Trail Dogs, this race is open to 400 runners. Registrants receive a tech shirt, trail socks, and a post-race meal. Pine Creek Challenge is a single-runner, 100-mile and 100k course, or 50-mile and marathon-distance run, on the scenic Pine Creek Rail Trail in September. 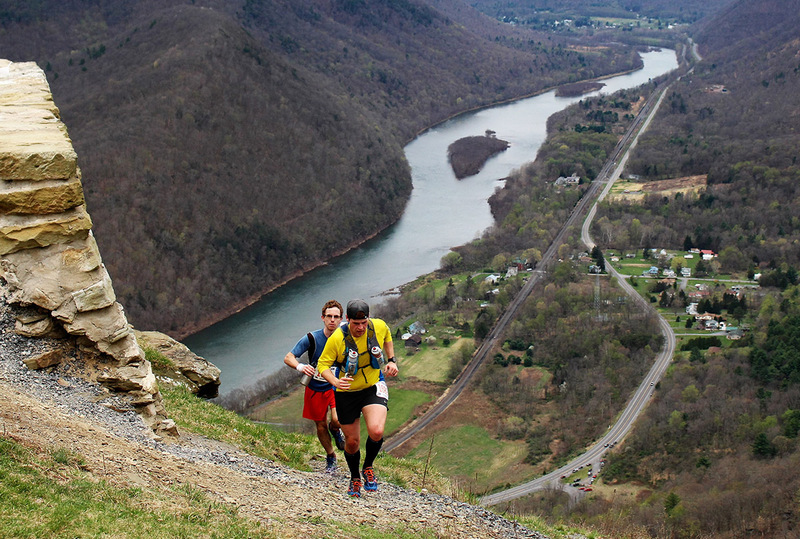 Taking place in the Pine Creek Valley & PA Grand Canyon landscape of the Pennsylvania Wilds, the area of the race is listed as a “Natural National Landmark.” Advertising itself as “beginner friendly,” 100 mile runners are encouraged to finish in 30 hours and 100k runners in 29 hours. The event is put on by the Tyoga Running Club with the support of the PA Department of Conservation & Natural Resources and Laurel Health. Not for beginners, the Eastern States 100 travels circumnavigates Pine Creek, a Pennsylvania scenic river and the largest creek in the United States. It is full of single track, old logging roads, abandoned stone quarries, hills, and endless views with over 20,000 feet of elevation. Deer, bear, bald eagles, and rattlesnakes may even be spotted during the run, which typically takes place in August. Racers must meet qualifying standards to enter this event, including completing within the last two years at least one 50-mile race within 16 hours or any race beyond 50 miles by the designated cutoff time. In the mountains of Tioga State Forest — just north of the PA Grand Canyon — runners can choose from a 15k, 25k, or 50k course. They will be confronted with challenging single track trails, steep climbs, stream crossings, log hurdles, and technical descents, all of which are unforgiving. Not for the faint of heart, the 25k boasts of a 4,000 foot ascent and the 50k of a 7,800 feet of ups. The Green Monster Trail Challenge typically takes place in October.